An interesting question on the VMTN forum caught my eye today, which was around configuring ESXi's Power Management Policy using the command-line via a kickstart script. I found this question to be interesting as I never had to tweak this configuration and was curious myself to see how you might be able to perform this via the command-line as I never recall seeing a command relating to the power management settings. After a few minutes of digging, I found that the standard set of CLI's such as ESXCLI, vim-cmd, etc. do not provide a way to configure ESXi's power management settings but did find it was possible using my other favorite "not officially supported" CLI called vsish. Now, you can of course create a remote script using the vSphere API to configure this setting, but if you are looking to modify this within a kickstart script, this is route you will want to take. UPDATE (01/12/15) - I just found out today from Engineering that it is possible to configure ESXi power management policy using ESXCLI. Though the parameters are currently set to hidden, you can use the following command to set the appropriate policy based on your enviornment. 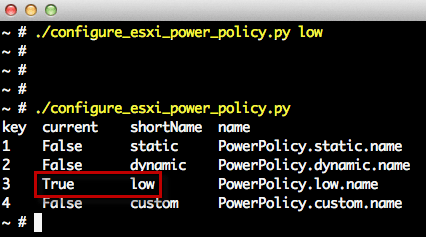 esxcli system settings advanced set --option=/Power/CpuPolicy --string-value="High Performance"
So now you can integrate power management settings in your ESXi kickstart script for automated deployment and configurations! The command works fine in scripts(KS) but after rebooting the server the currentPolicy is reversed to “Balanced”. Can you try to run the command & then run /sbin/auto-backup.sh and see if that persists the change after a system reboot? It’s work only when you make the change trough the “vSphere client”. Do we have a another way to set it in our scripts? In general, people are talking about setting a specific power management policy. Please, is it possible to retrieve the current processor frequency at runtime in VMware?With other hypervisors, they generally offer a “command”/ way to do it! Thanks for this. As mentioned by a previous commenter the setting does not survive a host reboot when configured this way, even when running the autobackup script afterwards. Has anything changed with 5.1 Update 1? Seems like a prime candidate for a fire-and-forget line in a kix build script if it could be made to persist!